In a medium saucepan, cover the potato with water and bring to a boil. Add a generous pinch of salt and simmer over moderate heat until the potato is tender, 20 to 25 minutes. Drain and let cool completely, then peel and cut into 1/3-inch pieces. Meanwhile, in a small heatproof bowl, mix the saffron with the boiling water until dissolved; cool. In a deep 8-inch nonstick skillet, heat ¼ cup of the olive oil until shimmering. Add the onion and a generous pinch of salt and cook over moderately high heat, stirring occasionally, until just softened, about 3 minutes. Add the zucchini, bell pepper and a generous pinch of salt and cook, stirring occasionally, until tender, about 5 minutes. Add the potato and cook until coated and hot, 2 to 3 minutes. Stir in the spinach until just wilted. Season generously with salt and pepper. Transfer the vegetables to a colander to drain and cool completely, about 30 minutes. In a large bowl, beat the eggs with the brewed saffron and a pinch of salt. Fold in the vegetables; let stand for 10 minutes. In a large skillet, heat 1 tablespoon of olive oil until almost smoking. Add the egg mixture and cook over moderately high heat, shaking the pan and stirring quickly with a spatula, until some of the egg starts to set, 1 to 2 minutes. Smooth the top, then cook over moderately low heat until the tortilla is mostly set but the top is slightly wet, about 7 minutes; gently lift the sides of the tortilla with a spatula while tilting the skillet to spread the egg around. Remove the skillet from the heat. Put a large, flat heatproof plate on top of the skillet, then carefully invert the tortilla onto the plate. Slide the tortilla back into the skillet and cook over moderately low heat until set, about 5 minutes longer. Slide the tortilla onto a serving board or platter and blot dry with paper towels. Let cool completely, about 45 minutes. Meanwhile, in a small bowl, whisk the mayonnaise with the garlic and the remaining 3 tablespoons of olive oil. Season with salt. Cut the tortilla into wedges and serve with the garlic mayonnaise. The tortilla can be wrapped in plastic and refrigerated overnight. Bring to room temperature before serving. Review Body: Came out exactly as pictured! i actually used two potatoes, instead of one. 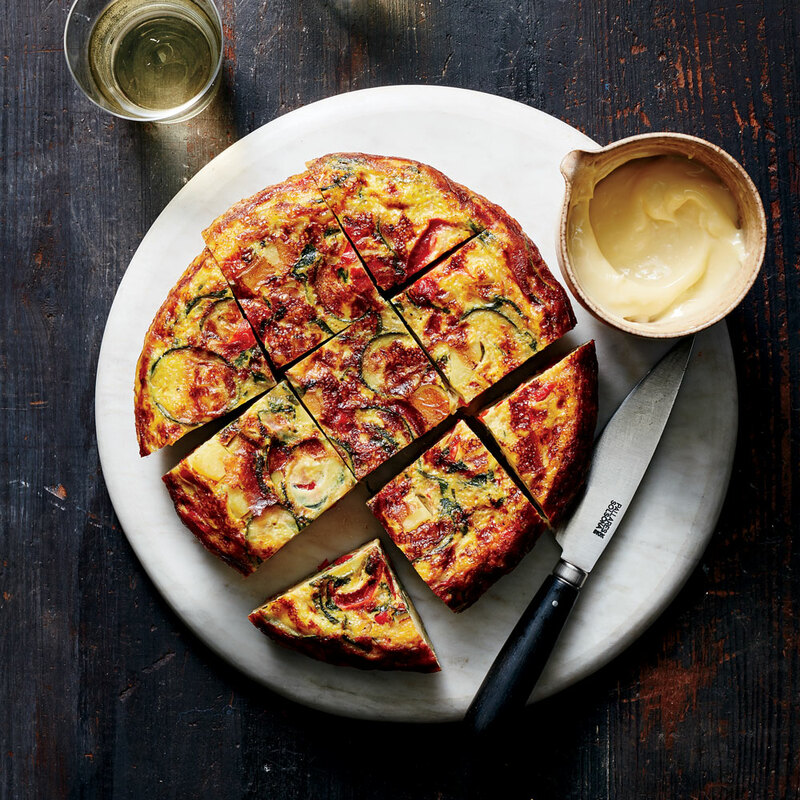 Review Body: Tortilla Española is very difficult to make requiring just the right recipe. This is NOT the right recipe. Definitely not enough eggs perhaps.. needless to say... this will look nothing like the above picture if you use this recipe... readers beware.